Mobile phone programming! Telephony hacking! Arduino prototyping! Fun workshops! 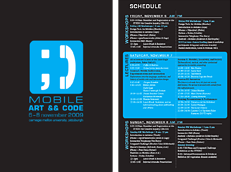 Mark your calendars for the MOBILE ART && CODE symposium, November 6-8th at CMU in Pittsburgh! MOBILE ART && CODE is a three-day symposium focused on the design of new forms of mobile and locative experiences. FRIDAY and SUNDAY feature hands-on workshops in arts-oriented mobile phone programming (including workshops in creating software for the iPhone, Android, Nokia, SMS text messaging, etc. ); interface design for mobile devices; interactive telephony and voice-response systems; and prototyping with the Arduino (a tiny computer which is popular for making interactive objects). SATURDAY is a lecture marathon, featuring a dozen presentations by leading international artists, designers, historians, hackers, entrepreneurs and researchers working in mobile and locative media. Mobile Art && Code is intended for anyone interested in learning more about developing mobile and locative experiences. Although the events take place at Carnegie Mellon University, you don’t have to be affiliated with CMU to participate. The workshops accommodate participants with a variety of technical skills: some are very introductory, while others are intended for people with a little bit of programming experience (like a semester of Java).